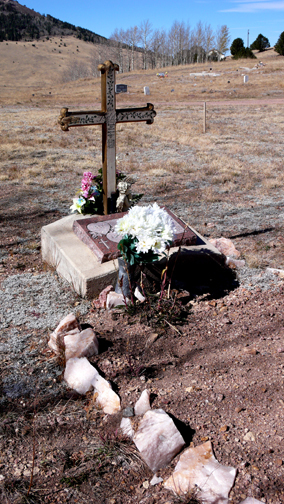 Scattered on a barren, windswept hilltop, outside of town and hidden from the casinos that have taken over the entire town, handmade crosses mark the graves of the miners who died far away from home. 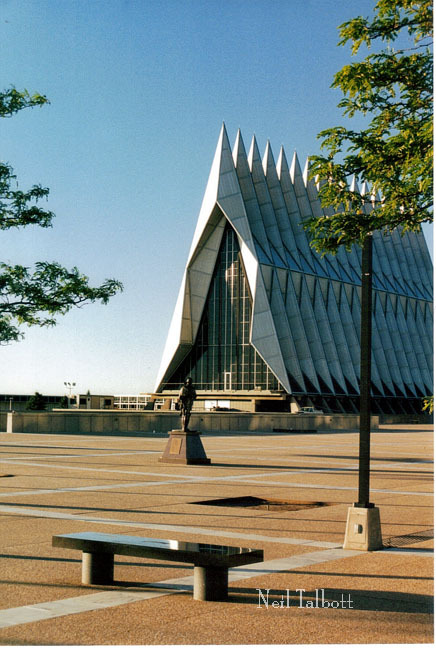 Neil Talbott’s Colorado Photography can be seen and purchased at his studio #105 at Cottonwood Center for the Arts, 427 E. Colorado Avenue in downtown Colorado Springs, CO. Can’t make it in person? Email Neil or reach him at (719) 523-0499. To say Jane Beeder travels the world is an understatement. From her years in spent in the Middle East buying antique strings of hand carved gemstones to her upcoming trip to Russia, Jane never misses a chance to search out the most exquisite and exotic beads for her original jewelry. In her recent show last month at Hayden Hays Gallery at the Broadmoor Hotel, Jane’s jewelry held it’s own with all the other masterpieces displayed. Crosses, whether they are antique Navajo sterling silver, gem studded artifacts from Morocco or hand crafted by local Colorado Springs artists, are combined with the rough-hewn gemstones, hand-forged crosses and elegant silver findings that are a hallmark of Jane’s work. 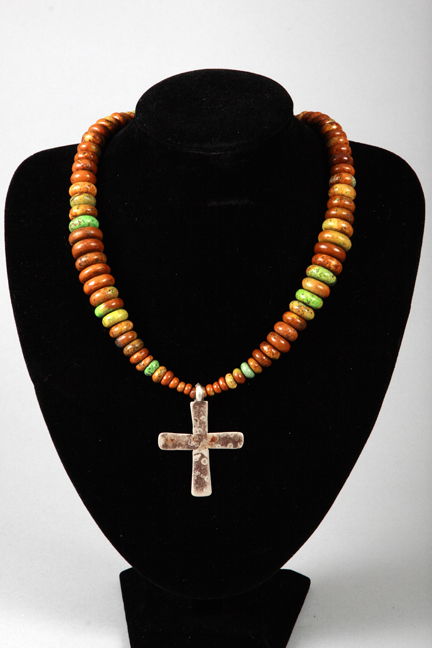 Many of her recent pieces combine Coptic (Ethiopian) Crosses with turquoise beads. Ethiopian crosses are made from elaborate lattice or filigree work in a baroque style. The artists designing the African crosses take great delight in creating ornate decorative patterns. They embellish a simple cross with trefoils, flared arms, fanciful projections, complex openwork and intertwined patterns of lines that symbolize eternity. Traditionally worn around the neck on a deep blue cotton cord, the crosses are given to children when they are baptized and they become one of the most prized of all personal possessions. Named after the region they come from, the crosses that Jane uses in her work are hand-cast and made from nickel or brass alloys. For more of Jane’s necklaces, check out photos of her work here on Fresh Ink. 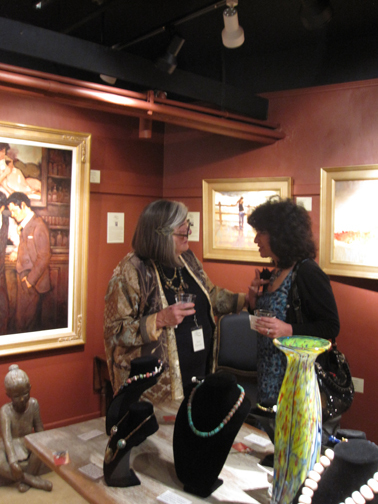 Jane’s studio, #103, is at 427 E. Colorado in downtown Colorado Springs at Cottonwood Center for the Arts. 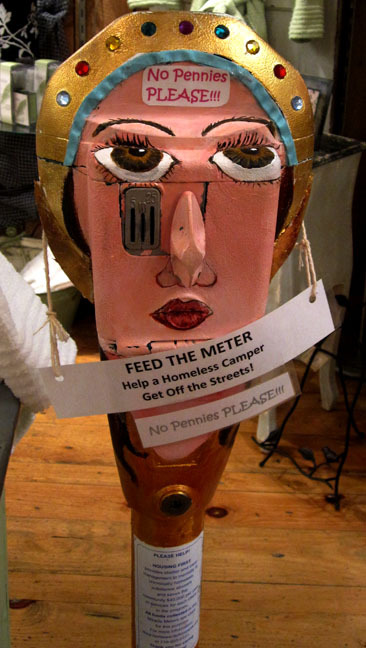 For more info about Jane’s workshop, call (719) 520-1899. 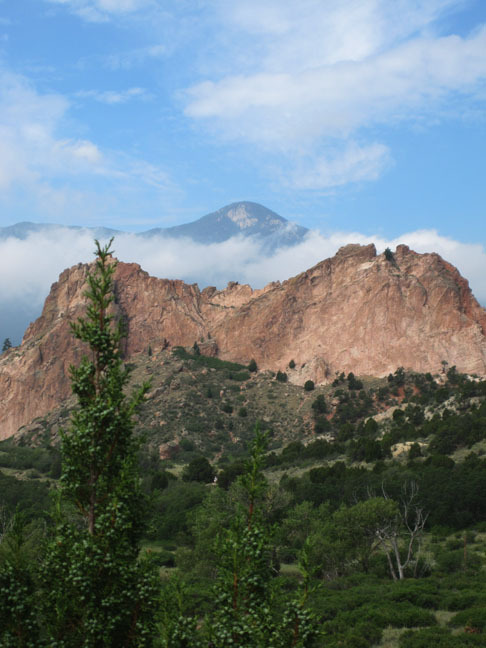 Her work can be purchased at Cottonwood on Tejon or The Boulder Street Gallery in Downtown Colorado Springs. 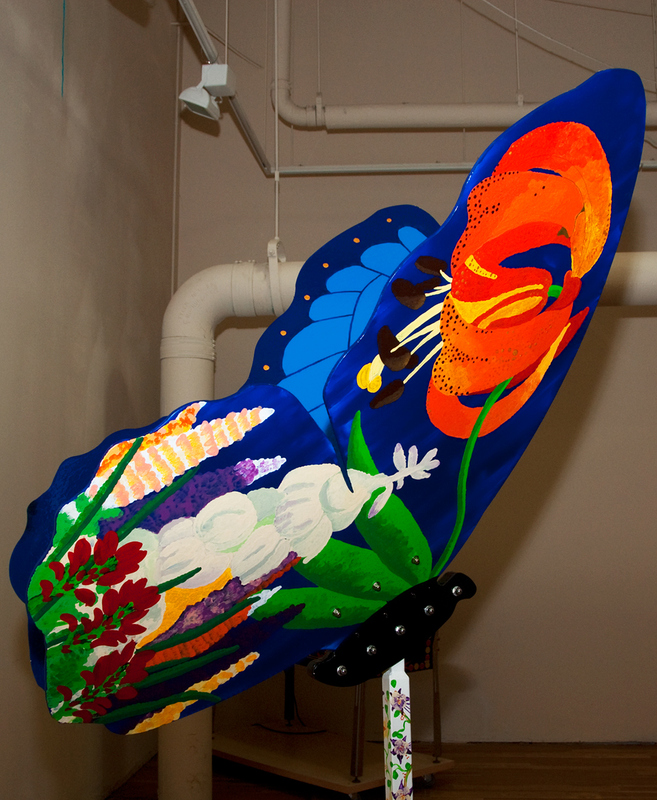 After taking flight at Colorado Springs’s Imagination Celebration , Dusty Shutt’s “Blue Morpho” butterfly has landed. Inspired by her strong Christian faith to contribute to her community, Dusty finds her work with organizations that help local chilidren to be her favorite. 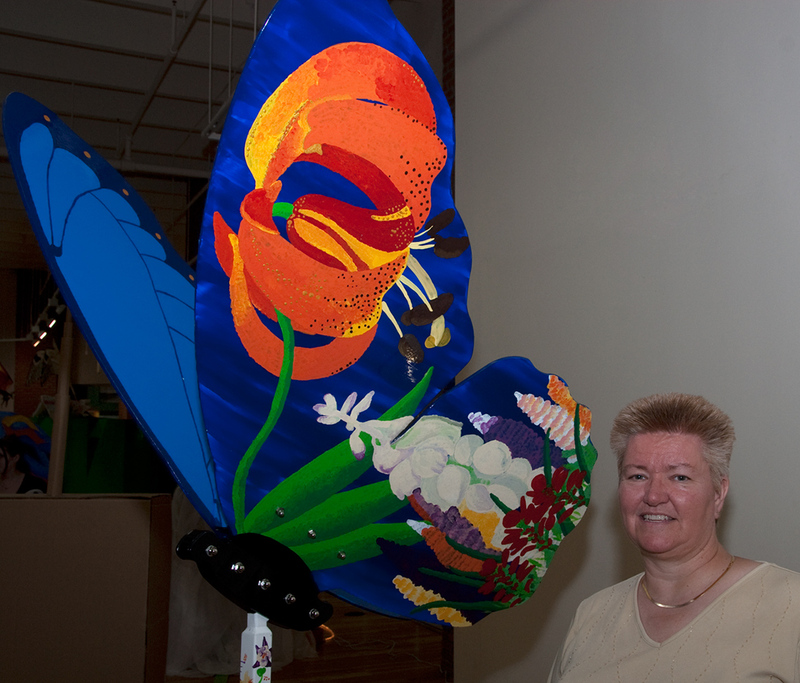 Donating her skill and time to create the colorful, exuberant sculpture to “Butterflies and Friends”, Dusty joins dozens of local artists who share the same passion to use their talents to assist local children. Butterflies and Friends is a community service initiative created by the Rotary Club of Colorado Springs to raise awareness and funds to serve children and promote the arts in local school. Participating artists raise transform large scale metal butterflies into works of art that are then auctioned on September 17th at Cheyenne Resort. In addition to raising attention to endangered species all over the world with her photo impressionism, Dusty contributes to raising awareness and funds to several causes at home in Colorado Springs. Dusty chose the short-lived Blue Morpho butterfly as the base for her inspiration, connecting the threatened rainforest dwelling iridescent butterflies with at-risk children here at home. As one of the few artists chosen to create a Butterfly for the upcoming Rotary Club auction at Cheyenne Mountain Resort on September 17th, Dusty and the generous group of local artists that paint the huge over-sized metal butterflies annually to do their part to ensure that a “healthy cocoon for every child” and to “encourage a creative metamorphosis into all that each can be”. My favorite kinds of church services are ones that happen outdoors. There’s just something about a group of people singing hymns outside under a blue sky early on Sunday morning that touches me. It seems to be more of a direct spiritual connection when the sound echoes directly up to the sky without a roof in the way. Chasing down an overheard reference in an Old Colorado Springs coffee shop, I stumbled on another of Colorado’s unexpected treats. Driving through most small towns, you wonder where the end of town is. In Penrose, 35 miles south on 115, you won’t have that problem. The town ends after a few blocks when the paved road abruptly does.The town has no stop lights, a volunteer fire department, and almost no problems except for what seems to be a group of entitled clowns. The Sunday I stopped by the Cowboy Church, there were more horses than cars. The steam rising in the cold air from riders and the huffing of the horses was a scene out of a cowgirl’s dream. When they read the Rodeo Cowboy’s prayer at the end of the service in memory of long lost friends, I wasn’t the only one in tears. occasion, mindful and thoughtful of the guidance that you have given us. As cowboys, Lord, we don’t ask for any special favors. We ask only that you let us compete in this arena. or a chute fighting horse, or a bull that is impossible to ride. that blows across this great land of ours. that you’ll tell us as we ride in that our entry fees have been paid. © Clem McSpadden. In memory of Howard Manuel, Jim Moore and Zachary Vanwhy.